Results of a new survey conducted by Toluna Inc. show that a majority of Americans want to retain a choice for paper options rather than be forced into “digital-only” communications. Chicago, July 21, 2016 – A new survey commissioned by Two Sides and conducted by Toluna Inc. reveals how U.S. consumers view corporate initiatives forcing people into digital-only communication by eliminating paper-based options. The survey also provides insight into consumer opinions on the environmental impacts of digital versus paper-based communications. Results indicate that many consumers want to retain the choice of receiving paper bills and statements at no additional cost. For example, 79% of respondents want the option to continue receiving printed information as it provides a more permanent record, and 77% would be unhappy if they were asked to pay a premium for paper bills and statements. Other key factors in retaining paper options were ease of reading on paper compared to a screen (79% prefer paper) and unreliable internet access (49%). 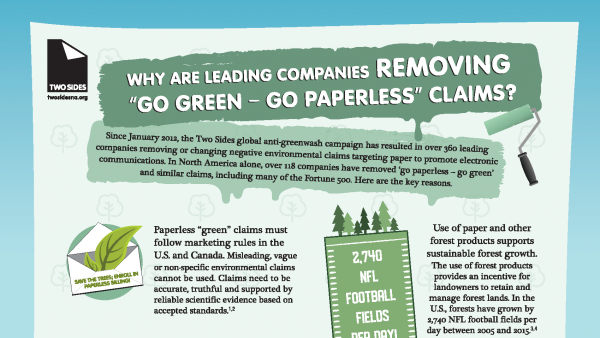 Many respondents (85%) agreed that cost-saving is the main reason why companies use environmental claims such as, “Go Paperless – Go Green”, or “Go Paperless – Save trees”. In addition, 57% of respondents reported that they question the validity of such claims. Phil Riebel, President of Two Sides North America notes, “Our results suggest that the environmental acceptance for print and paper is improving. For example, 88% of respondents agreed that when forests are responsibly managed it is environmentally acceptable to use trees to produce products such as wood for construction and paper for printing. This is good news for the graphic communications and forest products industries.” A large majority of respondents (91%) agreed that print and paper can be a sustainable way to communicate when responsibly produced and used. This is an increase of 19% when compared to results obtained in a 2013 Two Sides survey. More education is needed to raise awareness about the industry’s positive environmental activities, in particular its commitment to sustainable forest management and recycling. 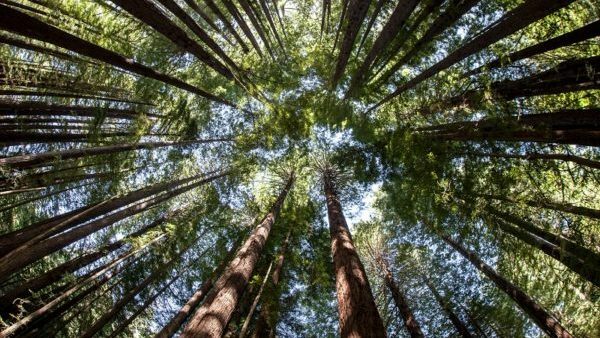 Despite U.S. forests growing dramatically in volume in the past 60 years (58% growth) and 3% in area, 55% of respondents believe that U.S. forests have decreased in size. The majority of respondents also did not know that paper is one of the most recycled products in the U.S. with recovery rates of over 66%. Compared to results obtained in 2013, almost three times more respondents reported seeing ads related to the effectiveness and sustainability of print and paper (35% in 2016 vs 12% in 2013), and the large majority rated the ads as credible and useful. 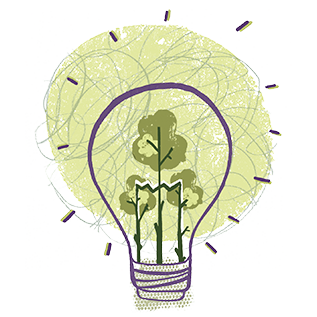 85% of respondents receiving environmental claims such as, “Go Paperless – Go Green”, or “Go Paperless – Save trees” believe companies are seeking to save costs (75% of 18 to 24 year olds). 57% question the validity of these claims (48% of 18 to 24 year olds). 94% agreed that recyclability is an important characteristic of environmentally responsible products (91% of 18 to 24 year olds). 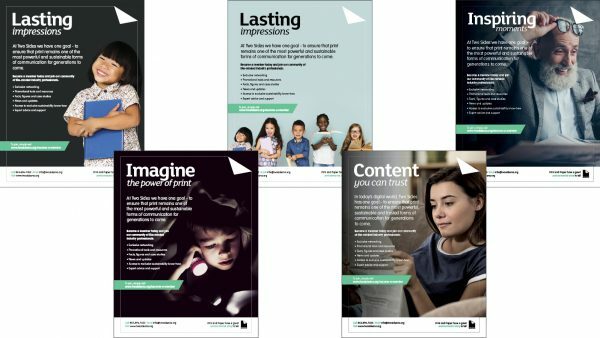 91% agree that, when responsiby produced, used and recycled, print and paper can be a sustainable way to communicate (86% of 18 to 24 year olds). 88% agree that when forests are responsibly managed it is environmentally acceptable to use trees to produce products such as wood for construction and paper for printing (81% of 18 to 24 year olds). 86% agreed that new forest plantations are necessary to counteract global warming (80% of 18 to 24 year olds). 79% agreed that reading from paper is nicer than reading off a screen (79% of 18 to 24 year olds). 78% are concerned about the effect on forests by the production of paper (also 78% of 18 to 24 year olds). 76% agreed that paper is based on a renewable resource (66% of 18 to 24 year olds). 76% agreed that print on paper is more pleasant to handle and touch when compared to other media (73% of 18 to 24 year olds). 56% agree that paper records are more environmentally sustainable than electronic storage of information (45% of 18 to 24 year olds). 79% of respondents want the option to continue receiving printed information as it provides a more permanent record (75% of 18 to 24 year olds). 77% would be unhappy if they were asked to pay a premium for paper bills and statements (70% of 18 to 24 year olds). 49% of all respondents don’t have a reliable internet connection and want paper records (44% of 18 to 24 year olds). 52% of respondents print some or most of their financial services bills and statements at home. 13 to 26% of respondents print between 1 and 20% of their electronic statements at home, depending on the type of statement. 6 to 13% of respondents print between 81 and 100% of their electronic statements at home, depending on the type of statement. 19% believe they have stayed the same. 11% believe they have increased in area (8% of 18 to 24 year olds). U.S. forests have increased by 58% in wood volume and 3% in area over the past 60 years (USDA Forest Service, 2012). 70% of respondents believe that less than 50% of waste paper is recovered for recycling (80% for 18 to 24 year olds). 9% believe it is over 60% (4% for 18 to 24 year olds). 8% of respondents correctly answered that paper products have the highest recycling rate in the U.S. when compared to other materials such as glass, plastic and metals (5% of 18 to 24 year olds). The current recovery rate for paper products in the U.S. is 66.8% (American Forest & Paper Association, 2016). Over 35% of respondents indicated that they have seen ads promoting the effectiveness or environmental friendliness of print and paper. This is almost 3 times more respondents than in our 2013 survey (12%), and the large majority rated the ads as credible and useful. Two Sides is an independent, nonprofit organization created to promote the responsible production, use and sustainability of print and paper. Two Sides is active globally in North America, Europe, Australia, South Africa, Brazil and Colombia. Our members span the entire print and paper value chain, including forestry, pulp, paper, inks and chemicals, pre-press, press, finishing, publishing, printing, envelopes and postal operators. For more information about Two Sides North America, please contact us at 1-855-896-7433 or [email protected]. Visit the Two Sides website at www.twosidesna.org and follow Two Sides on Facebook, LinkedIn, and Twitter.